This time last week, there were four nervous contestants preparing for their final performances on season seven of NBC’s The Voice. One of the front runners to win the competition was tattooed rocker Matt McAndrew. In the end, the trophy went to Craig Wayne Boyd of Team Blake and McAndrew landed in second place. It was a big disappointment for his fans, but McAndrew has a much more positive feeling towards his experience on the show. OHSOGRAY talked with McAndrew a couple days after the finale and he shared what he sees in his future. Were you surprised when Craig Wayne Boyd was announced as the winner of The Voice? Matt McAndrew: Not really. I thought I’d at least be in the top two and, honestly, without the iTunes bonus or anything and without the cumulative, I felt like it could’ve been anybody’s game. Obviously, Craig got a lot more of the phone calls—all the other different kinds of voting that I didn’t get. I’m happy for him and I’m happy for what I got out of it, for sure. What did Adam [Levine] say to you after the show? Matt McAndrew: Immediately after that, me, him, Damien and Chris just sort of stood on stage and kind of had a laugh to ourselves. Obviously, Adam wants to win and he’s super competitive, but the fact that we had three people in that finale was kind of hilarious to us. It was crazy. You got a lot of compliments throughout the season from Pharrell. Did he talk with you after the show? Matt McAndrew: Only briefly. I talked to him on stage. I felt like it was important for me to thank him for plugging me and my stuff. I thought that was really nice of him. He had some kind words for me, of encouragement and that it was only the beginning. It was nice to have that moment with him. A lot of people were impressed by your performance with Fallout Boy. Was that a highlight for you of the competition? Matt McAndrew: Definitely. Centuries is a great song, that was an awesome performance, but those guys are so cool. They’re really just genuinely nice, polite, down to earth dudes, so that made it ten times better. They were just really cool to work with. You seem to fit well in a band dynamic, is that something you would consider doing? Something like Daughtry has done? Matt McAndrew: That’s a good question. I don’t know. I’m going to pass on that, just because that’s where I started off as a musician. I started out playing guitar, then I started writing songs; singing was always an afterthought for me. I was always just a guy in a band singing and playing. That was fun, but then I just got to a point in college where I was playing more solo shows and I was doing a lot of acoustic, more like folky stuff at the time. That’s something that I still really enjoy, but being able to perform just by myself, me and a guitar. I feel like if I’m under my own name…obviously, I want to tour with a band, but I feel like that really gives me the freedom to go out there by myself and not be “front man from so-and-so.” I guess with Daughtry it’s just him, so that’s cool. As long as I get to do solo stuff, too, because that’s a lot of fun for me. Did you ever talk about the band v. solo decision with Adam, since he is the front man for Maroon 5, but also has a strong independent presence? Matt McAndrew: I think Adam was fortunate enough to meet a group of guys he really meshed with well, and that was always my goal in bands growing up. I was always looking for the dream team and the right people. The only person I’m still playing with is my bassist and he’s awesome. Everybody else…I’ve been having like a rotating cast. It just makes life so much easier when you’re the solo act. You don’t have to worry about anything else. I got a little bit of insight into how Adam feels about that, I guess, when I did “The Blower’s Daughter,” which was really in my wheelhouse…that’s who I was before the show, at least. He was just saying how he liked that I was doing that kind of performance because in his mind, that’s what it’s all about. Obviously, I can have a band support me and hold me up. But he was saying at the core of what I do it’s important that I be able to hold it down just me. I think he’s probably on the same page with that kind of stuff. Have you decided what you want to do for your next step or are you still processing everything? Matt McAndrew: I’m just happy. My goal is still to get a record deal here, so we’re working it all out. Honestly, I couldn’t be happier right now. “Wasted Love” has been doing really, really well. I’m sure there’s a lot of exciting stuff coming up. What do you feel was your best performance on the show? Matt McAndrew: I still think maybe my best technical performance was “Drops of Jupiter,” which didn’t get aired in its entirety, which is funny. On a technical level, I don’t know what my best was. I always make a few mistakes cause it’s live. But I would say probably my favorite and the most fulfilling one I did was “Wasted Love” and “The Blower’s Daughter” would be second. Maybe those two performances give you some insight into hopefully the direction that I’ll be going as far as my next record and everything. You already have a dedicated legion of fans, do you have a message for them? 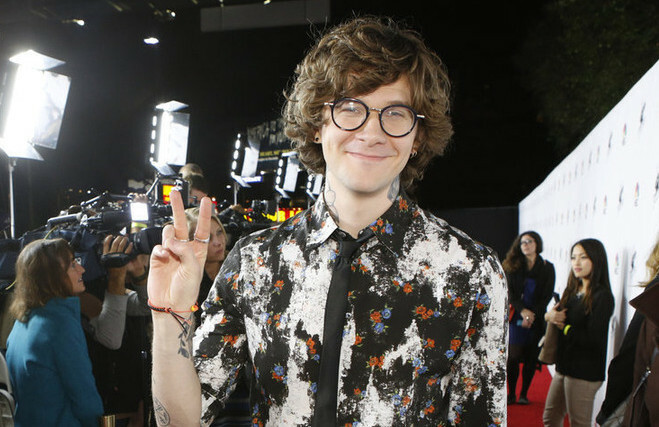 Matt McAndrew: I’m so grateful for everyone’s support and it’s all thanks to them that I’m where I am now. I’m in a really good, really happy place. I can understand if they’re disappointed with the outcome, but I’m in no way disappointed and I got more than I ever could hope for out of this experience. It’s really because of them. Honestly, the iTunes sales, I’ve been really blessed with some amazing stuff and that’s the way that I would rather have it. The fact that I was number one for two days is crazy, because of them. I just hope that they’re excited about everything and I think as things move forward, they’ll feel better about the way it all worked out.